Airbus new super-transporter Beluga XL made a maiden flight on July 19, 2018. The first test lasted four hours 11 minutes and ended at Toulouse-Blagnac, France at 14:41 hrs local time. Airbus new super-transporter is the third generation of Airbus transport aircraft. It is built to transport the manufacturer’s large aircraft components and will operate from 11 destinations. Based on an A330-200 Freighter, the Beluga XL is powered by Rolls Royce Trent 700 engines. The lowered cockpit, the cargo bay structure and the rear-end and tail were newly developed. The new cargo model is now one of the largest in the world and has 30% more capacity than its predecessor. 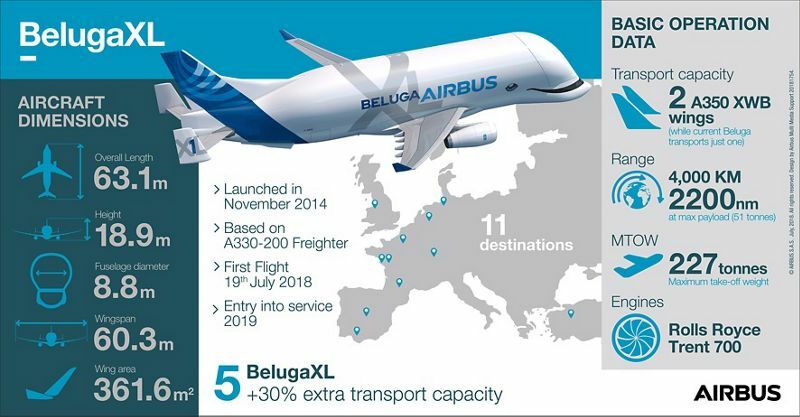 The Beluga XL will be 63 meters long with a wingspan of 60 meters with the ability to carry more than 50 tons of cargo. The manufacturer plans to build five Beluga XL models and eventually slowly phase out its current fleet of super-transporters. The Beluga XL programme was launched in November 2014. Following the maiden flight, Beluga XL will now undergo some 600 hours of flight test. The manufacturer expects the test to be completed over 10 months and the entry into service is expected later in 2019.